The sixth round of the World Superbike Championship brings the circus toward Portugal in the amazing Portimao’s toboggan. The track, which since its debut in 2010 calendar has already become legendary, once again gave two heats full of emotions. 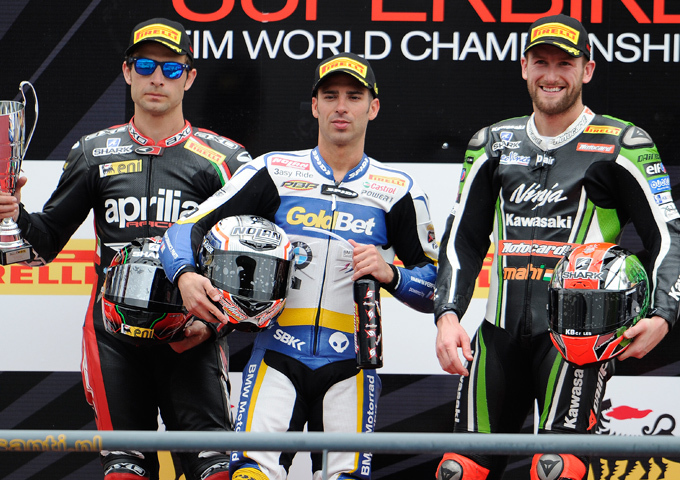 Race 1 is characterized by the battle between Laverty, Sykes, Melandri and Guintoli. Moreover was the incredible pursuit of Leon Camier taking his Fixi Crescent Suzuki from the 14th place to the 4° overall. At the checkered flag, Melandri leads in front of Guintoli and Sykes. Race 2 starts with Syke’s crash during the sighting lap, which will force him to a start from the Pits. Tyre problems also for Melandri’s BMW S1000RR, around thirs lap. It was impossible for him to continue the race with the leaders peace.